Race filters increase air flow by 25% over BMC street filters and are recommended for track use only. Following the F1 successes and the very good performance obtained by the Team Yamaha Belgarda and Team Suzuki Alstare Corona in the World SuperSport Championship, BMC air filters have proved to be the leading product in the category for its quality in material and construction. BMC air filters have been used to Race in the worst conditions to test performance and reliability. Current production uses the same materials already tested. BMC air filters range includes all the more popular sport street bikes, and it always increases including all the new models. BMC air filters are designed and produced to ensure a higher air flow than original paper filters. BMC air filters, made in cotton, minimize the loss of air flow pressure passing through the air filter; this way ensures the best conditions for full exploitation of maximum power. Therefore, the benefits of replacing the original paper filter with a BMC cotton air filter in your motorcycles are evident. Qualified engineers using advanced software and expert technicians using the latest technologies produce the BMC air filters. 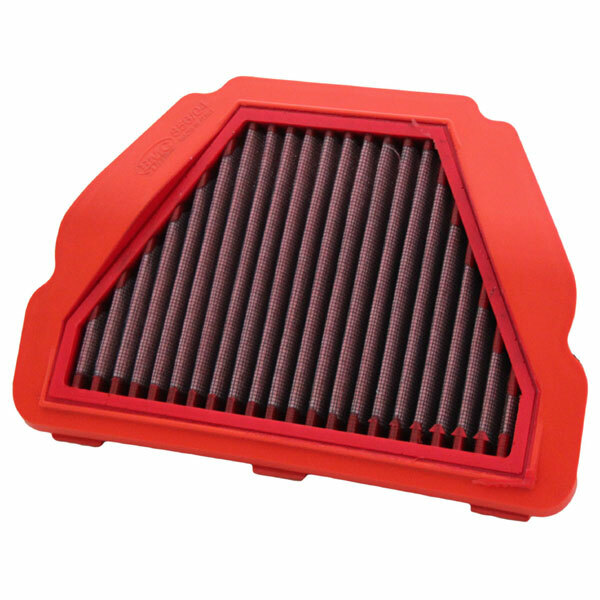 An F1 air filter, for example, must be very light, must be made of the best materials and must improve performance. For this reason, also for motorcycles filters we use only alloy mesh with epoxy coating to ensure protection from petrol fumes and from oxidization due to the humidity of the air. The filtering material is composed of a special cotton gauze soaked with low-viscosity oil to give you the best air permeability.